Have you not read that from the beginning the Creator made them male and female and said, For this reason a man shall leave his father and mother and be joined to his wife, and the two shall become one flesh? So they are no longer two, but one flesh. Therefore, what God has joined together, man must not separate. In this clip, Caleb is telling his friend Michael how his marriage is finished, to which Michael uses salt and pepper shakers to demonstrate a part of marriage often overlooked today – the EFFECT of matrimony. To many (like Caleb), marriage is an act that takes place between the man and the woman, but what many don’t realize, the marriage act has an lasting effect, a marriage bond, by which “the spouses mutually give and receive one another (and that union) is sealed by God himself” (CCC #1639). What God has joined together, let no one separate. Hardness of heart is a heart closed to love. Our society often equates ‘love’ with an emotion or feeling, and has forgotten the deeper, more accurate compass – that of commitment – by which to gauge ones relationship. This is important in any relationship, but especially in spousal relationships. Our feelings can betray us, and when the ‘feeling’ is gone, we seek to fill that void of emotion with something outside of our commitment (or covenant). May we learn from the One who is always faithful how to become persons of love. The Scriptures use the wedding banquet as a symbol of God’s love for us. Let us then, study His commitment, and pray, that in our own choosing to love, may the doors open to life-lasting relationships, and yes, love by God’s standard. Love is a Daily Decision (Marriage Encounter). Feelings are neither good nor bad; they just are. My actions are what I am responsible for. One shows how deep the love (for another) is by one’s actions when the other is in pain. Grace is needed to fulfill one’s vows when keeping true is inconvenient, or painful, or arduous, or unrewarding. The example you set by keeping your vows impacts your siblings, your children and your grandchildren. Similarly, failure to keep your vows also impacts others, both others in your family and those in the wider community. 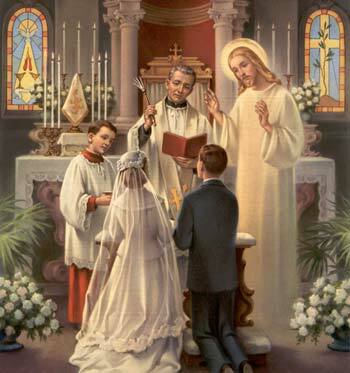 Dear Sr. Lisa Marie, Thank you very much for your important words on the Sacrament of Marriage. The reason marriage is a “sacrament,” is because it is “sacred” to Almighty God and to be held as highly as “sacred” by man. Please expand your next article on marriage with the great, and last Papal Encyclical on marriage; Pius XIth’s Casti Connubii (Chaste Marriage), more commonly titled as “Christian Marriage” from December 31st, 1930. The Sacrament of Marriage is in a crisis today (60% less Catholic marriages in the USA since 1970) mainly because it is not taught by priest and religious to be a “sacrament,” and NO effort is made to teach couples the Divine truths of Pius XIth’s Casti Connubii. Gary T., a traditional Catholic in the Arabian Desert.